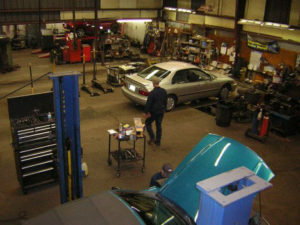 Services – Hurn's Superior Alignment Inc.
We provide the highest quality parts and service for all wheel alignments, front end repair and brake work. • Suspension Part Replacement; including tie rods, ball joints, wheel bearings, shocks and struts, control arm bushings, sway bar links and bushings. • Brake Repair on cars and small trucks, including turning of Brake Rotors on a lathe to smooth. • Wheel Balancing off the vehicle and if needed, Spin Balancing on the vehicle. Just a hard hit into a pothole, or a knock against a curb, can move a car out of alignment and begin the uneven pattern of wear on your tires. Also, as vehicles age or as the miles add up, the suspension parts designed to hold the wheels in the right position, can wear out. You may notice your tires wearing unevenly, especially at the inside or outside edges. Sometimes your steering wheel does not stay centered or the vehicle pulls to ones side or the other. Once we are under your vehicle we can evaluate what is just a noise or what may need replacement or what you can continue to use. Occasionally, a four wheel alignment is recommended, especially if the vehicle has been wrecked. • SUV’s and most Pick-up Trucks: $69. • Big Rigs: $125. per end, plus shim cost (if needed). Prices vary for modified vehicles with big rims or lifted or lowered.